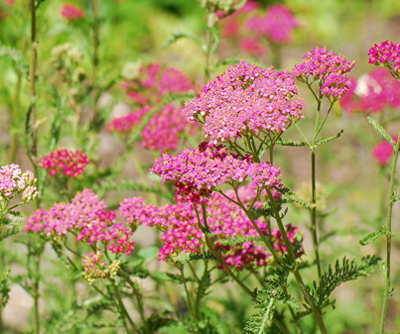 Achillea Millefolium are pretty perennials, with narrow, finely pinnately dissected leaves and small, cream or pink flowerheads in flat heads in summer. They grow in sunny sheltered spots, are good for cutting and drying, and especially suit cottage gardens and wildflower meadows. At the Country Life Nursery there is fresh foliage on these young plants which will be in flower from the end of May all the way into summer. This week only the normal price £7.99 is now just £3.99.